Make good use of vintage handkerchiefs in this pretty quilt set just right for a sweet little girl! The pieced bed quilt and pillow are adorned with satin, pink bows and applique hankies. Finish the quilt with a deep, lacy scalloped crochet trim. 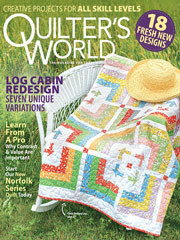 This e-pattern was originally published in the April 2010 issue of Quilter's World magazine. Size: Quilt: 48" x 60". Block Size: 12" x 12". Pillow: 12" x 12".